Excited to TELL the Story? One of the best things about knowing the bottom line story of the Bible is that you can then easily share it with others. All of us have people in our lives that could benefit from knowing the greatest love story ever told, and God has asked us to be prepared to share it with them. Take a minute and think about the people in your life who are far from God – people who need to know the story the Bible tells. Is it a family member? A friend? Someone you work with? A neighbor? A lso think about the believers you know who couldn’t explain the simple story of the Bible to someone else. Most Christians fall into that group. Do you have friends, family members, home Bible Studies, or Sunday School classes, that could benefit by coming to understand how the Bible all fits together into the one story of God’s love for us that is woven through the entire Bible? The list of people could be endless because most people simply don’t know the bottom line story of the Bible. Not long ago a friend of Bible StoryBoards told us about his 6-year old daughter who used his iPhone and our Bible StoryBoards app to share the story of the Bible with two different adults (an uncle and a family friend) who don’t have a relationship with God. Using the 15 StoryBoard pictures she talked them each through the story of God’s love for us and what He’s done to bring us into a relationship with Him. Whether you are 6 or 66, Bible StoryBoards can help you tell the story of the Bible to the people in your life who need to know it. Here are three tips for making the most of the opportunities that come your way to share the story of the Bible. 1. Prepare Yourself to Share the Story. Like the Apostle Paul you want to be ready and willing to share the Good News found in the Bible with others (see Colossians 4:3). Here are some things you can do right now to make sure you are ready. Learn the basic storyline of the Bible. 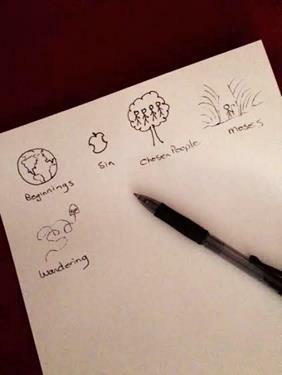 If you already completed our Bible StoryBoards Eager to Learn the Story instructions, you should be ready to go. If you haven’t, begin by getting to know the story for yourself by reading the Bible StoryBoards book. Then spend some time making sure you are familiar with the 15 pictures and the storyline that goes with each one. If you’d like some help learning the story, it is available here. Load the 15 Bible StoryBoard pictures onto your phone. Having the Bible StoryBoards app, or the 15 PDF pictures, on your phone can be a huge help. You can simply flip through the pictures as you tell someone the storyline. But you can also draw the pictures as you tell the story if you’ve taken the time to memorize them. Either way, using the 15 pictures will help you remember the storyline and tell it to others. You can purchase the Bible StoryBoards app here. The PDF pictures are available here for purchase, or if you purchase the Bible StoryBoards book here, we will email you the PDF pictures for free. If are interested in learning how to draw the pictures, start here. Intentionally build relationships with people who are far from God. As you live life with them and share God’s love with them, you will find opportunities to have spiritual conversations with them. Pray for open doors and open hearts. Your part in sharing the story is only half of the equation. Without God’s work, your work will fail. Just like the early church depended on the Holy Spirit as they told others the good news about what Jesus has done for us, we need to do the same. So pray! 2. When a door opens, simply tell the story. Everyone loves stories. That’s the mindset to have as you share the story of the Bible with others. It’s a story. So tell it like a story. Share the story with unbelievers. It will take courage to do that, but if you keep your focus on simply telling the story, and not preaching or lecturing, you’ll be amazed how open unbelievers are to hearing what the Bible is all about. Share the story with Christians. You’ll be surprised how many don’t know the story but would love to know it. You can help them learn how the Bible all fits together into one story of God’s relentless pursuit of a relationship with us. Share the story with your family, class, group, club, team, church, neighbors, or… What circles of influence are you connected to? Those groups are your Jerusalem. Begin right where you live, with the relationships you already have. 3. Tailor your approach to their needs. That’s what Jesus did. With Nicodemus Jesus focused on his need to be born again. In His encounter with the woman at the well, He offered living water. With the rich young ruler, He dealt with the problem of possessions. Each unique opportunity needed a one-of-a-kind conversation. You won’t be able to share Bible StoryBoards with everyone. You may want to, but not everyone will be open. A simple question like “Has anyone ever helped you understand the story of the Bible?” could reveal if a person is open to hearing you tell them the story or not. Some storytelling opportunities will be brief. Not everyone has the time or interest in hearing an expanded version of the bottom line story of the Bible. That’s okay. The fact is, you should work hard at keeping your storytelling brief. Then if people want more details you can go back and fill them in. Some storytelling opportunities could go on and on and on. If someone is really interested in knowing the story of the Bible, you might decide to focus on one storyboard at a time as you get together on a regular basis over coffee or breakfast or whatever. If that’s the case, don’t rush through the StoryBoards. As you talk through the storyline, take the time to discuss what it means and how it connects with your life. There really are a number of ways to tell the story of the Bible. No one way is the right way. With a readiness and willingness to share the story, and sensitivity to the Holy Spirit’s leading, God will use your faithfulness to spread the good news that His story tells – God loves us and wants a relationship with us, now and forever. And that’s something worth telling others about. If you’d like help learning the story of the Bible, go to our Eager to LEARN the Story page by clicking here. There you will find helpful suggestions.